Life Before the Dinosaurs: Archaeopteris. 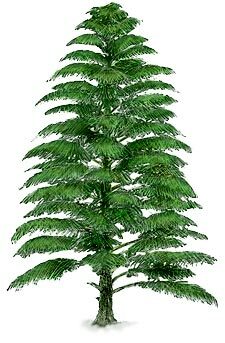 Archaeopteris (not to be confused with Archaeopteryx) was a tree that lived from the late Devonian to the early Carboniferous. It looked like a conifer with fern-like leaves, and had a trunk that was up to three feet wide. Archaeopteris is similar to the older tree Wattieza. These are both considered to be the first modern trees. The leaves of Archaeopteris were first mistaken to be ferns and the trunk of Archaeopteris was thought to be Callixylon. But then paleontologist Charles Beck found out that they were both part of the same plant. Archaeopteris means "ancient wing," referring to the feathery appearance of the leaves. It also means the same thing as Archaeopteryx. Archaeopteris seems to have lived near bodies of water such as rivers, streams, and lakes. It also made some of the first real forests. Archaeopteris had large root systems, which was usual at the time, and produced spores instead of seeds. 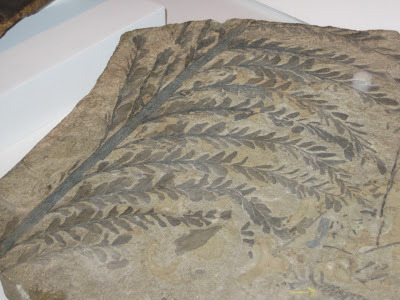 The fossil leaves are beautiful! They're so well-preserved.